"Please. I hope Kase-san likes me..."
Yamada is a shy second-year high school girl who is a member of the greenery committee. Kase from the class next to hers is a beautiful girl who is the ace of the school's track team. As a result of the morning glories planted by Yamada, the distance between the two people who have never exchanged words shrinks little by little. Kimi no Hikari: Asagao to Kase-san. is a promotional video of Hiromi Takashima's Asagao to Kase-san. manga, the first installment of the Kase-san Series. It features Hanako Oku's song titled "Kimi no Egao (album ver.)" from the 2012 album good-bye. Kimi no Hikari was first released on the YouTube channel of Anime Pony Canyon on May 7, 2017. 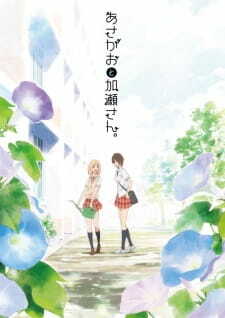 It was later bundled as a Blu-ray disc with Apron to Kase-san., the fourth manga volume in the series, on July 25, 2017. It's a promotional video for a manga, so don't expect anything. I rated it a horrible 3/10 because I rated it based on the same factors that I use to rate other animes. There's no story, which makes sense considering this is a promotional video, it's not supposed to spoil any part of the story. Anyways, there is no development. The whole anime is just 2 girls spending time together. There's a short part in which we are shown a dramatic scene which I'm sure makes perfect sense in the manga, but in here it's an isolated scene, and we are not provided with any context, so it kind of comes off weird, stupid, and pointless? Same things with the characters, the video shows off nothing more than "cuteness". I liked the short haired girl tho, cause I have a fetish for masculine females, but yeah, it didn't really make the characters any better. So why am I even writing this review? Why do we do anything at all? Does anything even matter? If there's one thing you can take out from this review, it's the fact that I'm attracted to masculine females. I think this PV is a cute way to get people interested in watching the OVA that's coming out soon, and reading the manga! The animation is pretty, and it has some cute moments and sets a very nice tone! It does its job. It's not supposed to be a stand-alone story, it's literally a promotional video. So, I enjoyed it and will definitely watch the OVAs when they air, and read the manga as well! I wouldn't go out of my way to watch this video, but there's nothing bad about this video either, so no harm done regardless of your decision to watch it or not, especially since it's only six minutes long. Tired of watching 12 episode shows and getting frustrated because of the "go read the manga lol" endings? Well look no further! This anime is a promotional video for the manga from which it's based from, and boy does it get the job done. The whole thing is aesthetically pleasing, the animation is nothing special, but the stuff like character design and background art are forceful. From watching this I'd definetly start reading the manga if I wasn't doing so already. The music is your generic mellow J-Pop song, but I honestly wouldn't expect any other type of music from something like this. The only real problem is that although it classifies as "anime", it doesn't really have much substance by itself, it only really works because it's just a promotional video. Bottom line, as an anime, is meh, but as promotional video (which it's the only thing this should be considered as) it's pretty damn good. And in the vain of promotion, go read the manga! It's a cute and lovely yuri manga with some melodrama here and there, definetly worth your time. It's a short promotional video for the manga Asagao to Kase-san. I enjoyed this PV for being so visually pleasing, and bringing animation to a manga I really enjoy. I think it could have been much better if sections of the animation were voiced, instead of having a song featured throughout the whole animation. I don't know exactly how this PV looks to someone who hasn't read the series, but apart from the Shoujo Ai theme, it seemed to be hard to interpret and lacking substance. The animation was visually and audibly pleasing, but I feel there just wasn't enough impact to pull a lot of people in on that alone. I think it's worth it to check out this PV, especially because it's only around 6 minutes long. If it interests you at all, I encourage you to read the manga and check out the OVA, because the actual series is pretty good. I rate this animation as a 7/10. Kase-san TV Anime Adaptation Has Been Announced!